"This excerpt from the monologue by Mike Daisey, The Agony and the Ecstasy of Steve Jobs, participated in the awareness of working conditions in Chinese factories of Foxconn. Except that he was entirely invented. It is the scandal that shakes the last few days the media world Apple. 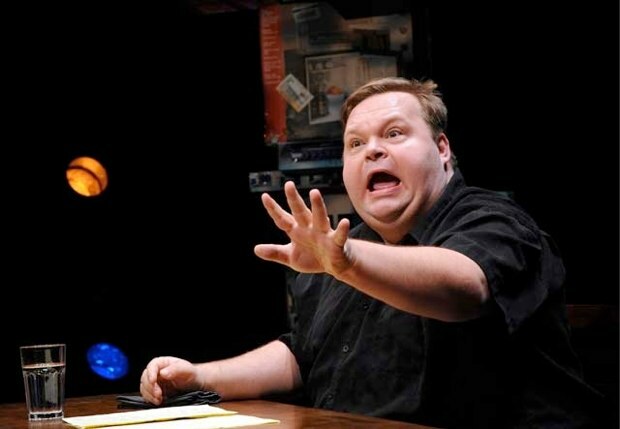 Mike Daisey's monologue is a specialist: on stage, sitting behind his desk on which are placed a few notes to guide his performance, he has dissected the operation of Wal-Mart, analyzed the evolution of American democracy after the attacks of September 11 or written about the personalities of Bill Gates and Ron Hubbard. Created in early 2011, The Agony and the Ecstasy of Steve Jobs, who follows this line, alternating sides of the back story of the founding of Apple and the parties on the conditions of production units of the Cupertino Company. Its common thread is the double dichotomy of Apple, Steve Jobs / Steve Wozniak, cool image / production conditions. This piece marked by the experience of Daisey, man embodying the text on stage and in all media having relayed. Technology enthusiast who traveled to China for the purposes of his work, he has touched Steve Wozniak: "I'll never be the same after seeing this show. Mike's experience of pain instead of describing it. Showman and talented communicator, Daisey has highlighted the appalling conditions of production of electronic equipment within Foxconn factories in Shenzhen. Problem: the same way that Apple's historical chapters are riddled with factual errors, its chapters are tainted Chinese approximations that go beyond the simple license artistic. The hoax was revealed by Rob Schmitz, China correspondent of Marketplace, a program of the American Public Media. The transition from Mike Daisey to This American Life, issuing another public media, Public Radio International, has put a flea in his ear, too much detail differed widely with his own daily experience in the field, it is a expert on economic issues in China. With a simple Google search, he found the interpreter Daisey in China, Li Guifen, known in Western countries under the name of Cathy Lee. In all questions asking if Daisey has actually seen what he describes in his piece, the answer, which falls like a chopper, is always the same: "no. "No, Daisey has not seen for miners. No, he did not see armed guards at a Foxconn plant. No, he has not talked to dozens and dozens of workers, especially those who were poisoned with n-hexane. No, he did not discover the iPad to this man in hand ground. Yes, Mike Daisey has made its history. In a special episode of This American Life which was attended by Rob Schmidt, singer-songwriter admits, to backwards. Rob Schmitz Cathy says you have not discussed with the workers who were poisoned with n-hexane. RS: So you lied about it? This is not what you saw? MD: I would not say it like that. RS: How would you say? MD: I would say I wanted to tell a story describing my journey as a whole. Ira Glass [Ed: the presenter of This American Life]: Have you experienced workers? Or did you simply read about it? MD: I met with workers, um, Hong Kong, who went to the demonstrations against Apple. They have not been poisoned with n-hexane but knew people who were, and it was a constant topic of conversation among the workers. GI: So you have not met workers who were poisoned with n-hexane. Mike Daisey takes refuge behind his status: he is not a journalist, but the best fabulist: "I will not say I did not take some shortcuts in order to be heard. But I take my job. My mistake, the mistake I bitterly regret that it is bringing it forward as journalism on your show. And it's not journalism. This is theater. "An excuse that does not: for months, Daisey tells anyone who will listen that he saw with his own eyes all that he narrates in his play, television, radio, print. The recent addition of a prologue to his play pop only reveals its contradiction: the audience does not come with an entertaining work of fiction; he is attending a moving story, a true story. Fabulist, Daisey is undoubtedly an excellent and more. With this piece, however, it becomes storyteller, strange for someone who wrote a monologue about the lie. In Truth, Daisey already confessed, in 2006, having fabricated a story to pass the fourth wall. "After telling this lie again and again, it became an integral part of the room, so that it was impossible to remove, or at least to distinguish it from what had really happened "Says Jason Zinoman.”Lying is acceptable when the lie is serving a greater truth? What does the truth in the context of art? "We will leave these philosophical questions remain open, noting that they do not apply to journalism supposed to be interested only in truth. The media success of Daisey nevertheless highlights the failure of crossing sources with Public Radio International: The author has certainly lied about their identity to his interpreter, said to be "unreachable" at the time of registration of the issue, but his name was clearly indicated in the transcript of the room. A simple Google search would have to find it and perform the audit work - and clearance - has led Rob Schmitz. Paradoxically, this failure only magnify the genius of Daisey's narrative: the story was too good, too well written, well formatted too, not to be adopted by the media. Describe the situation of workers of Foxconn in Shenzhen and Chengdu is not easy: either Fort Knox sometimes new settlements, factories of Chinese giant welcome workers subject to the ordinary universally stupefying production chain, who commit suicide sometimes, but they are better paid than the average Chinese worker. A set of paradoxes particularly difficult to summarize without oversimplifying ("plants, it's funny nowhere") or needlessly complicating ("it is a scandal of neocolonialism"). Daisey served his story on a silver platter to the media in search of explanations. Foxconn said (about this case and not working conditions): "This has caused great harm to the company image. The fact is that the media should not have mentioned this program before without asking for confirmation. We will not bring a lawsuit ... We hope that nothing similar will happen again. "Daisey has lied about his experience, but the facts are there: Foxconn guards beat up a journalist a little too curious; several workers were poisoned with n-hexane, but it was at Wintek, too many suicides have taken place in the same place and at the same time to be a statistical anomaly, some suppliers have a bad habit of using some minors. By putting simple words on this reality, with a tone and face both man and authoritarian, simplifying the situation in broad strokes with a highly directional axis, Daisey has enabled many to equate these concepts and understand the situation. The Agony And The Ecstasy of Steve Jobs's spirited storytelling and moralistic fables, and that's what makes it paradoxically indispensable. His play has consistently had a major impact, although it is based on a set of lies. It caused a series of articles of the largest newspapers in the world, including The New York Times, she justified sending many journalists in Shenzhen, Foxconn and forced to open for the first time its doors, or rather, she motivated Apple to go even further in its efforts to ensure transparency in subcontracting. In lieu of an annual report on social responsibility of its suppliers, the Cupertino Company now provides a monthly report with detailed data, allowing associations - including those with which it has decided to collaborate - to quantify progress of respect for workers' rights. It is perhaps this impact makes all the more shocking truth about the "work" of Daisey, because it runs the risk that these efforts be released today, and that the perception of Foxconn recedes the new reality. It has not met with miners, who are increasingly rare. But he may have met these young adults from the countryside looking for a well paid job, but physically and mentally exhausting, so that some no longer have the strength to jump from a window. Mike Daisey did not need to tell stories: the simple truth is intolerable enough to score. These lies will ultimately reveal that our cynicism: if Foxconn employees are ordinary workers, buy our electronics products is not a crime. They had to be transformed into modern slaves to awaken a collective consciousness buried under layers of self-righteousness Western.